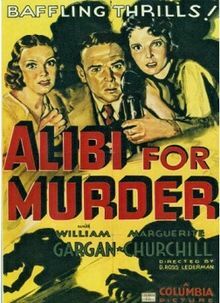 Breezy murder mystery has radio reporter William Garagin who is in the house of a reclusive industrialist when he commits suicide. Garagin isn't too sure and on his broadcast a short time later he states that he suspects that it was murder. This opens up the floodgates as Garagain is threatened, given misleading information and an attempt is made on his life. A Columbia Pictures release the film feels more anemic then most poverty row films. I've seen dozens of low budget films but there is something about this one from one of the majors that just feels cheap. While the performances are fine, the plot seems to be missing something. Its a breezy 61 minutes long but there seems to be reel or two of material missing. I kept watching this with the constant feeling that I was missing something. Plot points don't develop they just suddenly appear out of left field for no good reason. Plot, what plot? Its more an idea. Its a mess. Amusing, but a really big mess. Is it worth seeing? Only if you run across it. Its nothing I'd try to search out.